It is my distinct honor to be featured today on the front page of The Santa Fe New Mexican, one of the longest running newspapers in the southwest. 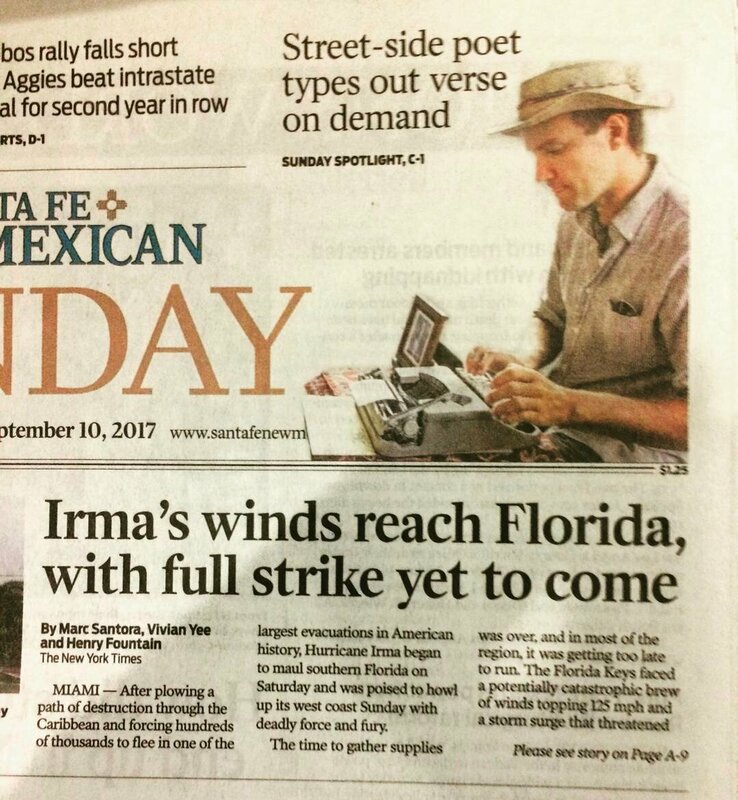 Straddled beside news of Hurricane Irma’s impending landfall, I’d like to think I’ve been typing up a little hurricane of my own over the last 2 years while I’ve lived in New Mexico. One that instead of wreaking havoc and destruction, has brought light to the four corners encouraging people to think more with their hearts, connecting to their surroundings. There have been many predecessors before me, cultivating the street poet hustle, and I honor them all hoping that this little feature serves to inspire those that follow. Thank you so much to Robert Nott for the interview and to Gabriela Campos for this shot of me amid thought, soaking up the air with a furrowed brow, and my tongue hanging out in an ever so slightly clownish way. Most days I am still absolutely amazed that this is my life. This is my body. I really appreciate everyone who has supported me along the way in getting here. Every word of encouragement has been a much needed push to keep me on my path, continuously moving forward.